Oakland has a storied history of igniting social movements led by gifted creators across industries who both understood and embraced the responsibility of having a platform capable of influencing the masses. Seeing the success of brilliant Bay Area filmmakers like Ryan Coogler, the director behind record-breaking box office hits like Black Panther and the Creed franchise, one emerging storyteller is poised to follow in his footsteps, extending the legacy of multimedia creators intent on shifting the paradigm and introducing progressive ideas through artistry. After watching a compelling commercial chronicling the journey LeBron James and the road to achieving his first title in Cleveland, 24-year-old Tevin Tavares was inspired to tell impactful stories. Tavares first earned notoriety for producing an original video for Kendrick Lamar’s LUST, which appears on the rapper’s Pulitzer Prize winning album DAMN. Within a short period, the short film went viral, landing on media outlets like Complex, XXL, Pigeons and Planes and 2 Dope Boyz. The video generated such a response that most outlets perceived the film to be Lamar’s official music video for the song. In 2015, Tavares and his team followed up Lust with a short two-minute film entitled The Shoes, an in-depth expose’ of the complex issues plaguing sneaker culture, which also drew critical acclaim and widely circulated the web. Cementing a distinct style and approach, he quickly teamed up with friends Sutton Raphael and Carlyle Garrick to launch Combined Culture in 2016, a multimedia production company focused on producing cross-platform concepts for global brands and media companies alike. Leveraging this newfound momentum, Tavares left a promising position climbing the corporate ladder with the Golden State Warriors and took a leap of faith and moved to Portland, Oregon with ambitious aspirations to create content for Adidas. Working around the clock to solidify his position, Tavares would proceed to make his mark. While in his role with the brand, he seized the opportunity to collaborate on a slate of national campaigns and product launches, developing a sharper outlook on his intended goal and adopting key skills to further propel his storytelling abilities. Since placing the bet on himself and stepping into the industry, Tavares has paved an impressive path independently. He has notably partnered with leading fashion and lifestyle brands like Nike, Adidas Originals, Jordan Brand and the NBA. 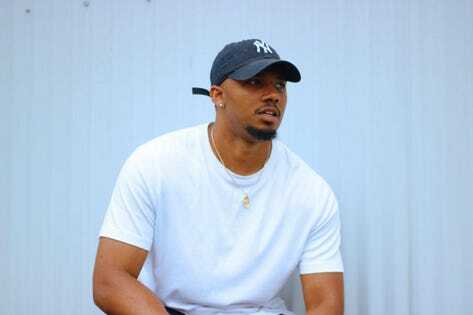 His most recent works include directing a short film for NBA standout Jabari Parker, as well as directing a digital feature entitled Destroy Doubt that follows the life of Pittsburgh Steelers star receiver Antonio Brown for The Players’ Tribune. Setting his sights on telling the tragic story of Nia Wilson, a Bay Area teenager who was fatally stabbed by a white man at the train station in July, Tavares looks to take the proven template he’s established and apply to producing powerful films that drive important conversations forward. I spoke with Tevin about his come up story, mastering the craft and his bigger vision for telling impactful stories across screens. Mitchell: What was the defining moment or spark that inspired you to step into filmmaking? Tevin Tavares: LeBron had just won his first championship with the Miami Heat and Nike ran a commercial called The Ringmaker. The spot showed the process of a ring maker watching LeBron along his journey from being drafted to holding the trophy. They had Marvin Gaye’s song ‘I Want You’ playing in the background. It impacted me in a real way, because it showed LeBron repeatedly going through different types of adversity — From him losing, battling and finally getting that championship ring. The reason why the Marvin Gaye song touched me nearly to the point of tears is because that was my grandfather’s favorite artist, so my dad always had a poster of the I Want You album in the house and he would play it all the time. When I was watching LeBron’s journey, I compared it to my own. I went to a junior college out of high school while all of my friends went to four-year schools, because I broke my hand my senior year that stopped me from receiving a football scholarship. It seemed to end my football dreams. But, I’m seeing LeBron endure this extremely challenging process to win his first ring and it gave me so much inspiration. That’s the moment I truly realized how commercials can make you feel. I realized the power of storytelling. I realized the power of representation and seeing people experiencing the same struggles as you while sharing the same aspirations to be greater. After seeing that commercial, I knew what I wanted to do — I wanted to create commercials for Nike. Mitchell: After coming to this realization, what immediate steps did you take to start bringing your vision to life? Tevin Tavares: I knew that the only way I was going to be able to do that was by moving to Oregon. If I’m going to produce commercials for Nike, I have to be where they are. At the time, I had an internship with the Golden State Warriors in their Marketing department. I was hanging shirts on seats, handing out Jack In The Box coupons and hustling to establish myself. While I was working the internship, I received scholarships to go to Oregon. I networked with a bunch of people from Nike. Finally, I received an internship at Nike my junior year of college, and that’s when everything changed. Right before starting my internship with Nike, my friend Carlyle came to me and explained how advertising doesn’t capture that feeling anymore — they don’t tell real stories that evoke real emotion. He had an idea to create a film and release it. He wrote a poem called The Shoes, which told the story of a young man being robbed and shot for his Jordan sneakers. Growing up in the Bay Area, we’ve seen this reality play out many times. So, I met him the next day with my friends Sutton and Jose to make this short film. I played the lead role, portraying a kid who worked hard to be responsible and earn his own money before being shot and killed. After watching the final edit, I lost my mind, because I saw myself acting out this real story and bringing out the raw and honest emotion in it. We had to fly out to New York for an advertising trip, and by the time I got off the plane, the short film had spread everywhere. Thousands of people across the country watched something that we made in a matter of hours. That’s when I hit me that this combination of filmmaking, writing and acting gave me the ability to directly impact people across the world all within a two-minute video. Mitchell: Describe the evolution from directing and releasing your first film to producing your first projects for brands like Nike and Adidas? Tevin Tavares: After that film, Life of Pablo had just came out, so we decided to make a spec commercial film for Kanye. I brought together a group of like-minded people from different states who were individually skilled and all loved Kanye’s music. We had a room filled with 20 college-aged kids from across the country, reflecting every race and walk of life. We created the false campaign for Kanye called Dream Create Conquer, aimed at inspired kids to do all three. If you have a dream — create it, conquer it and move on to the next. After putting the short film out, it went viral again. I told my instructor that if I shot this right, I would end up getting a job at Adidas. Funny enough, the film was featured on Nice Kicks and attracted the attention of top executives at Adidas. Sure enough, before graduation, I landed a job with Adidas Originals. It felt like the best story of my life. I was creating content I believed in, working at the companies I always dreamed about and was in position to do more. Ironically, once I graduated and started at Adidas, everything started falling apart. I thought I was the man walking in, thinking I was going to just create cool videos and campaigns every day. Instead, it was a sobering reality check, because they had me doing a lot of admin work that only reminded me why I didn’t feel like a fit in the corporate world. I learned a lot at Adidas and connected with a lot of people. But, the day eventually came when they let me go from the brand. Mitchell: You were nominated for a College Emmy for your work — Describe the process of creating that film and what inspired it? Tevin Tavares: After Nike, I started an internship at Jordan Brand. It seemed to provide everything I wanted. It was a global company, I was stepping foot on the Nike campus every day, I was walking past all of the iconic sneakers, and I was interacting with Nike executives regularly. But, one day I hit a turning point. I was watching a Dame Dash interview in which he was speaking about becoming your own boss. It made me think about the many moments at Nike where I thought maybe the corporate life wasn’t for me. That moment gave me the spark to start my own agency. I called it Combined Cultures, because being from the Bay Area, all we do is combine cultures. When I came back my senior year, Nike didn’t offer me a full-time job, so I starting thinking about my next move. One day, while sitting with five of my friends, we were watching the news and saw that not too far outside of Eugene, there was a community college shooting. The mass shooting was all over major news outlets. After seeing how devastating it was, we collectively decided to do something about it. When mass shootings happen, they always tell the story about the kids who were shot, but never the people who witnessed it. So, the five of us created a film to tell the other side of the story. I wrote, directed and played the lead role in it. We told the story of a kid who barely escapes a mass shooting and the different stages of the experience through his perspective. It was one of the most rewarding experiences I ever had with my team. The film spread again, across local and national news outlets. We were invited to schools to speak about the film, what to do when mass shootings happen and ways to be protected. A few months after it released, we were nominated for a College Emmy and saw our work competing against people from all over the country. That experience really kicked off Combined Culture and gave me the direction for where I wanted to take the company and my craft. Mitchell: How has your process and experiences shaped how you define success and what a ‘Dream Job’ really looks like? Tevin Tavares: Those experiences taught me the important of putting the people and culture first. A lot of times we think corporate puts the culture or black people first, not to disrespect any brands, but that’s not their first priority. I would be in meetings and see young black faces getting exploited. I’ll be in a room working on a campaign driven by black people with a majority of white people in the room making the decisions. That’s where it hit me that my position as the owner in control of telling the stories was crucial. Working in-house at brands was cool, but that corporate system wasn’t where I would be most effective or reach my potential, because I care too much about the culture. I believed that I could do on a high level on my own in another lane. I’m not at all trying to bash big companies, but I don’t think their structure and approach aligns with mine. At times, I was too passionate about things that they simply didn’t align with or share the same passion for. There’s nothing wrong with that, but its not an environment I want to move forward in. Mitchell: What would you describe as the formula to tell stories that have such an important impact and how do you define success with these projects? Tevin Tavares: I look at it through a Ryan Coogler lens, wherein I always put my own Bay Area cultural twist on any film I produce. It’s the same thing with Combined Cultures. If you look at the story we told — we told the story of a young man with Cerebral Palsy and a young man with ALS. If you look at any ESPN story highlighting anyone with a disability it’s often very sad in tone. We want to flip the sadness into motivation and encouragement. Although it’s a very serious and sad topic, we still wanted to make sure it feels Hip Hop and modern; something people can connect with culturally and develop a better understanding. That’s success, making it relatable to people in a way that they can feel it, but also see themselves within the storyline. We find a way to mix these different elements that wouldn’t commonly blend well together. When you merge cultures together, it’s the same thing. You’re taking aspects that may appear very separate or specific to certain groups, but you find the commonalities that make them relatable. When I look at success, I look at how people feel. If people tell me that they legitimately cried after watching one of my films, that’s success to me. They feel so emotionally impacted after experiencing the work that they have to step out and take action to make a difference in real life. It also means they’re going to share the story, which means there will be one more person made aware and impacted enough to help save a life. I don’t want people to look at these stories and feel sorry for them. Instead, I want them to feel strong and inspired to help them and those in the same position. Mitchell: How would you define your philosophy or the guiding principles that fuel your work? Tevin Tavares: My main mission in this world is to inspire through my creativity. Since I was 18, I’ve loved telling stories and using my platform to share my perspective. I realized that is was through my creativity and storytelling that I got my point across or effectively shared my perspective with a broader audience. That’s one thing that I wake up every morning and aspire to do. How do I use my creativity to reach the next level? How am I going to use my creativity to achieve my goals? How am I using my creativity to help my family, my friends and my community? How am I going to elevate my life through creativity.